FREE TO THE PUBLIC - Meet John and see a slide presentation of his work. "On any given day you'll find pots in all stages of completion. Sometimes the ware carts are full. Other times, right after a series of firings and art fairs, there will only be a few pieces in progress. I still do everything by hand. All my pots are thrown on the wheel. I use one wheel for throwing and another for trimming. Even after thirty years of making my living as a potter I still enjoy my time at the wheel. Aside from the sheer pleasure of the feel of my hands-on clay, I love the spontaneous results that come from clay turning into form. Though I may set out with a fairly specific shape in mind, the action of the wheel, and sometimes the cussedness of clay, can result in an even more interesting pot than I had in mind. Through that slow evolution, I can look back at the "same" pots I made a few years back and be amazed at the subtle changes that occurred without plan." FREE TO THE PUBLIC - Meet Andrea and see a slide presentation of his work. 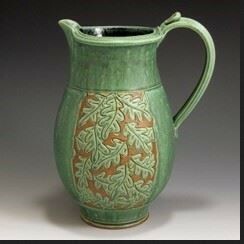 In 2016, after completing her MFA in Ceramics at Syracuse University (NY), Andrea Denniston set up her studio along side husband and fellow potter Seth Guzovsky at their pottery, Poor Farm Pottery, in Floyd, VA. She has been working as a full time studio potter in Floyd for the past three years. Her work is primarily wheel thrown with a grolleg porcelain clay body that she fires in an electric kiln to cone 7. 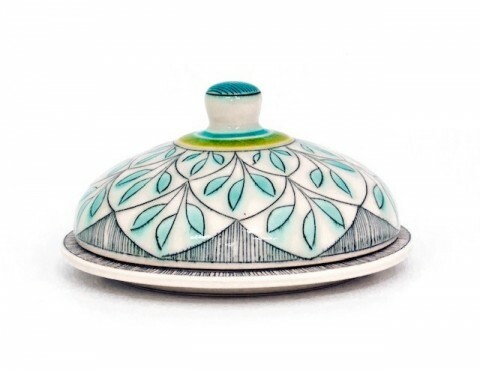 This allows for a bright white canvas, providing vibrancy her glazes and decoration. 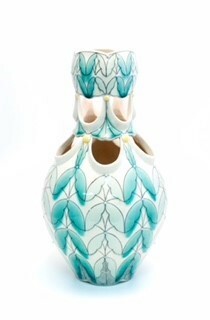 Inlayed underglaze lines cover the surfaces of each piece. These lines form repeating patterns and floral motifs that reference traditional quilt blocks, architectural ornament, Art Deco patterns, stained glass windows, and 16th century Iznik tiles. In 2017 Andrea was named a Ceramics Monthly Emerging Artist and featured on the cover of the May issue. In 2016 she received the NCECA Graduate Award for Excellence - 2nd place - in the National Student Juried Exhibition. Also in 2016, she was also included in Chemical Addiction – Exemplary Ceramic Surfaces from the Rosenfield Collection at Harvard University, Gallery 224, Cambridge, MA. In the spring of 2016 Andrea was a Turner Semester Resident Artist at Angels Gate Cultural Center in Los Angeles, CA. She has also published two articles in Ceramics Monthly - "Balancing Comfort and Concept" in February 2016, and "Small Batch, Small Hatch" in February 2017. Friday Night Lecture: "Rumor Mill"
The life of the ceramicist is burdened by post-firing depression. We will examine the glaze flaws that cause it and how to keep them from happening. How do we go from a formula on a page to beautiful glaze? It seems baffling and intimidating and if you ask 10 people about how they work, you'll get 10 different answers.It doesn't have to be that way. In "Glaze of Our Lives- Understanding Glazes for the Beginner" We'll tell you the story of glazes, how they work, why they work and why they often don't work. We've crafted a workshop for makers of all levels. We'll tell and show you what is going on inside the kiln, to help you make sense of glazes. So that you can make your studio the best it can be. Matt Katz along with his wife Rose are the founders of Ceramic Materials Workshop. Matt has a Bachelor of Fine Arts from Alfred University and a Master of Fine Arts from University of Colorado- Boulder. In addition to his training in the arts, for 15 years Matt has worked as a research scientist in the ceramic engineering department at Alfred University.Matt teaches ceramic materials to artists for Alfred University, he is also on the faculty of Harvard University, The Rhode Island School of Design, The Herron School of Art, Montana State University and many others. In his time Matt has dedicated himself to unveiling the myths and mysteries of glazes.